The Wire Center Edition gives you a total picture of the North American Public Switched Telephone Network (PSTN). You can use this data to identify all active NPA NXX combinations, what areas they serve, where the service comes from, and who provides it. This data set contains a wealth of telecom information. It is suitable for any application requiring the LATA, switch CLLI code, serving wire center, Rate Center, carrier, and other data associated with a particular NPA NXX combination. WCV INTEGER The four or five digit V&H coordinate system vertical coordinate of the wire center. WCH INTEGER The four or five digit V&H coordinate system horizontal coordinate of the wire center. RCLONG VARCHAR (128) Full name of the geographical Rate Exchange Area, commonly referred to as the Rate Center. A Rate Exchange Area identifies the geographic area (i.e. locality, town, or city) served by a particular NPA NXX combination. DISCONNECT CHAR (1) Single character field specifying the exchange has been or will be disconnected on the specified effective date. ADATE DATE Eight-digit date the block was assigned. Formatted as four-digit year, two-digit month, two-digit day of month. EFFDATE DATE Eight-digit date the block was or becomes effective. Formatted as four-digit year, two-digit month, two-digit day of month. FEATURES VARCHAR (512) 2-character alphanumeric Central Office type codes for the switch. Generally present for United States wire-line offices. PORTABLE CHAR (1) Single character Y/N field indicating the NPA NXX or NPA NXX-X has been establish for "portability". CLLI CHAR (8) Eight character CLLI code used to uniquely identify the wire center. This code is equivalent to the first eight characters of the Central Office eleven character switch CLLI code. V INTEGER 5-digit wire center vertical coordinate. H INTEGER 5-digit wire center horizontal coordinate. City VARCHAR (128) City the wire center is located in. State CHAR (2) 2-character state, province, or territory abbreviation. Latitude DOUBLE Latitude of the wire center specified in decimal degrees. Longitude DOUBLE Longitude of the wire center specified in decimal degrees. MSA CHAR (4) 4-digit Metropolitan Statistical Area code. 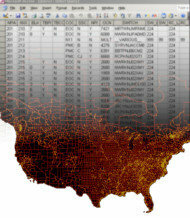 CMSA CHAR (2) 2-digit Consolidated Metropolitan Statistical Area. FEATURE_CODE CHAR (2) Two-character alphanumeric feature code. DESCRIPTION VARCHAR (64) Description of the central office feature.